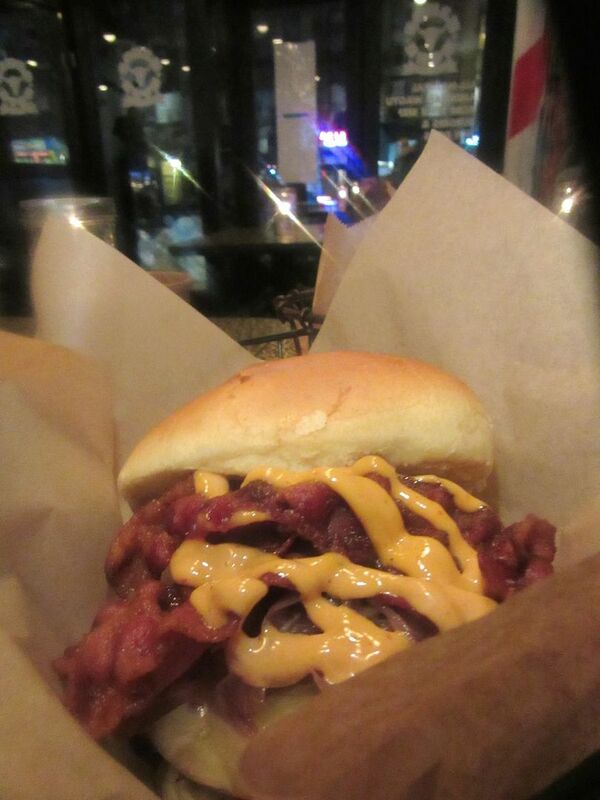 The Duke of Lux burger layers caramelized onions, bacon, smoked gouda and chipotle aioli. My friend the veteran publicist sent me the Technicolor jpg -- a chorus line of cuties from her new client, Kings of Kobe. 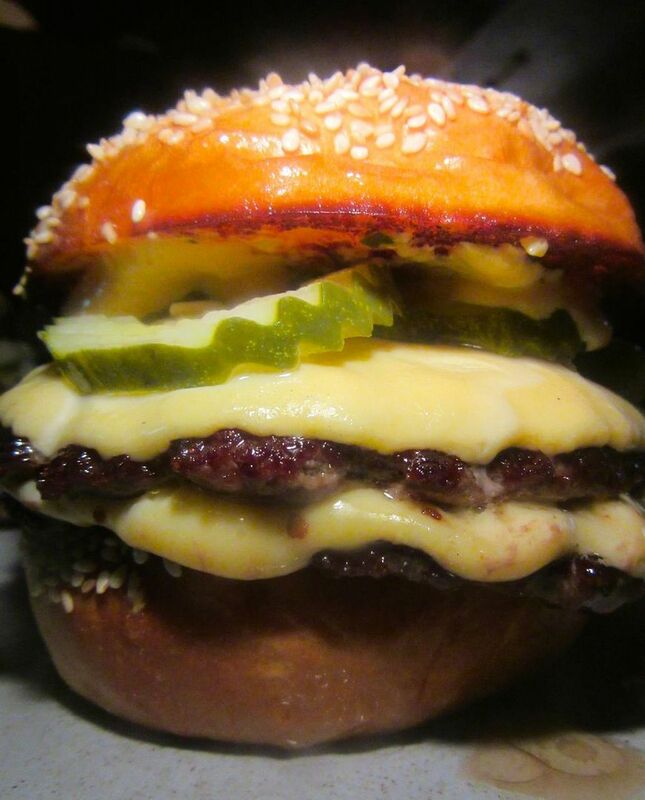 It’s just 18 seats devoted to hot dogs and burgers made with American Wagyu in the fast food heaven of Ninth Avenue. I remember when guys swooned over Playmates. I’m fantasizing a high calorie affair with these hot dogs. 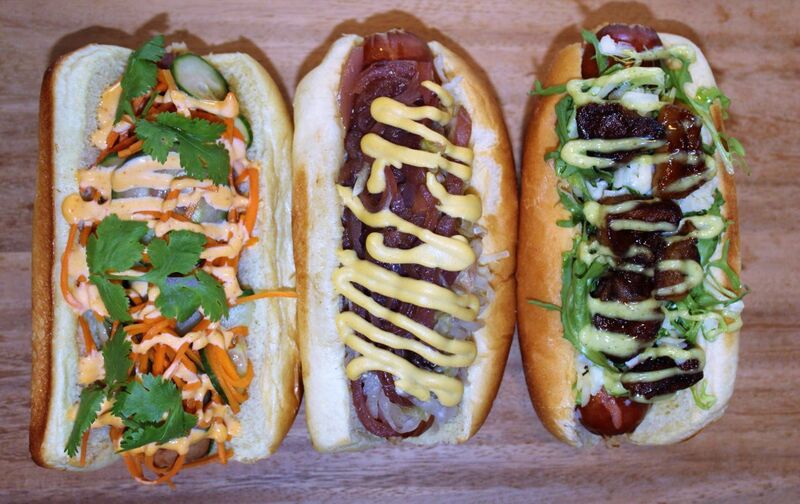 This publicity photo of the designer hot dogs at Kings of Kobe set off my craving. I couldn’t wait to get there. The images haunted me. But none of my usual dinner cronies is willing to join me for a fast food evening. “I can’t forget when you made us go to Guy Fieri’s,” one of my regulars reminds me. So I throw myself into the $250 omakase at Suzuki and join the upper east side swimmers at Charles Masson’s new Majorelle. 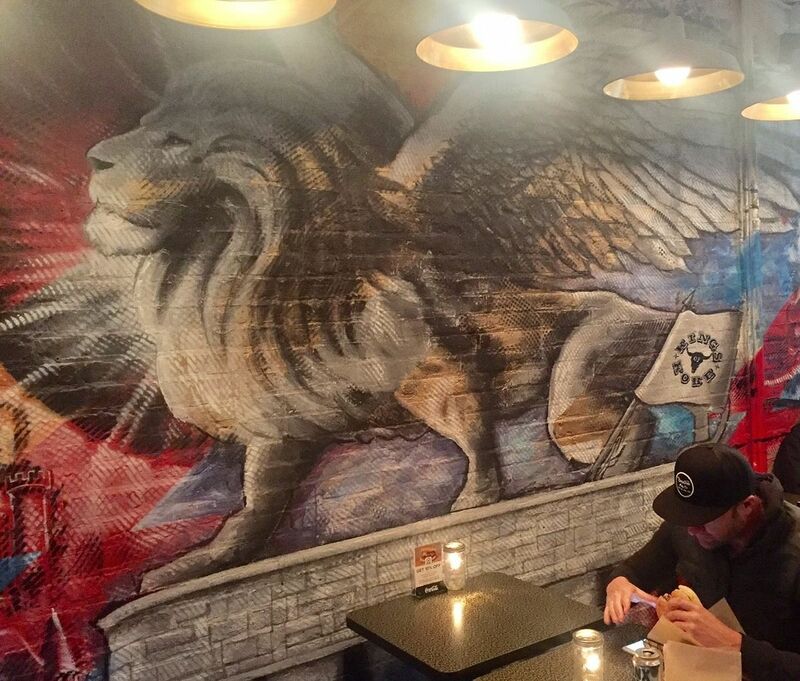 The raging lion on the wall doesn’t seem to interrupt dinner. YES! “That’s for me!” Carla emailed. 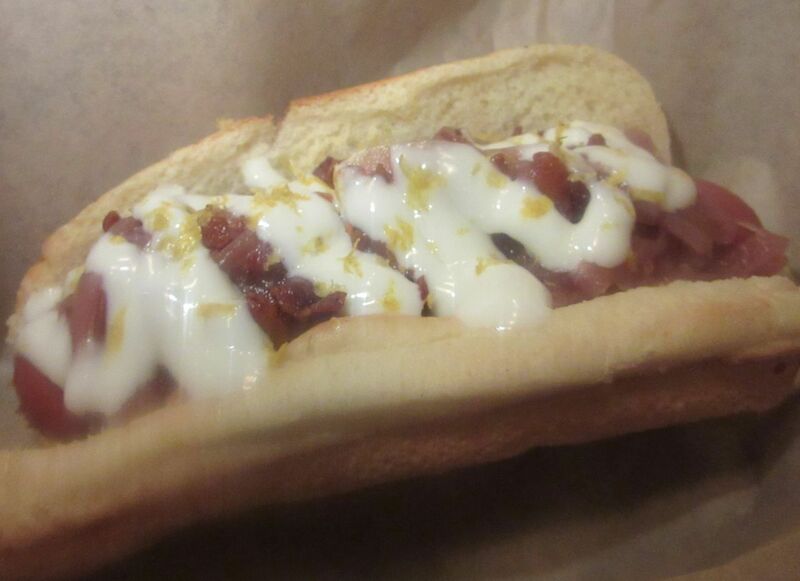 I added the “All Night” dog, crispy bacon, onion marmalade, lemon zest. Alas Carla doesn’t like blue cheese. If you’re a delicatessen purist, you might sneer at anything more rococo than a big fat kosher special at Katz’s Delicatessen with a few dabs of mustard. I’m with you on that, too. But I hungered to sample the Kings $9.25 All Nighter with crispy bacon, onion marmalade, lemon zest and blue cheese dressing. Lemon zest! What elegance. 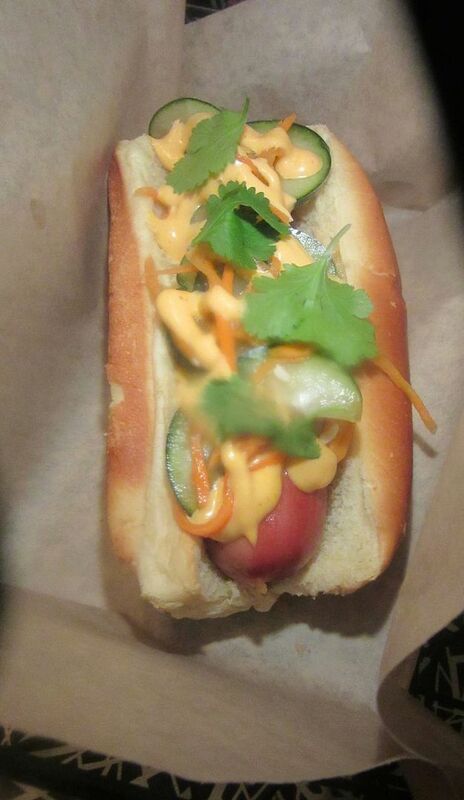 The Vietnamese-inspired Banh Mine dog hits the table just as Carla finally arrives. I cringe a bit at the thought of the $8.75 Manhattanite with caramelized apples, frisée, shredded cheddar and wasabi aioli. (Maybe the wasabi would keep it from causing sugar shock.) I wonder if Carla will join me in the cola-soaked caramelized onions and cream cheese of the $8.25 Sweet Munchies. Research can be challenging. Hungry, but not wanting to be rude, my niece and I order cole slaw and sweet potato tots while waiting. I step out of the cab into an icy floe, ducking through the freezing rain with my niece Dana. We’re early. The waiter brings water. And a glass of ice. More water. Carla is late. 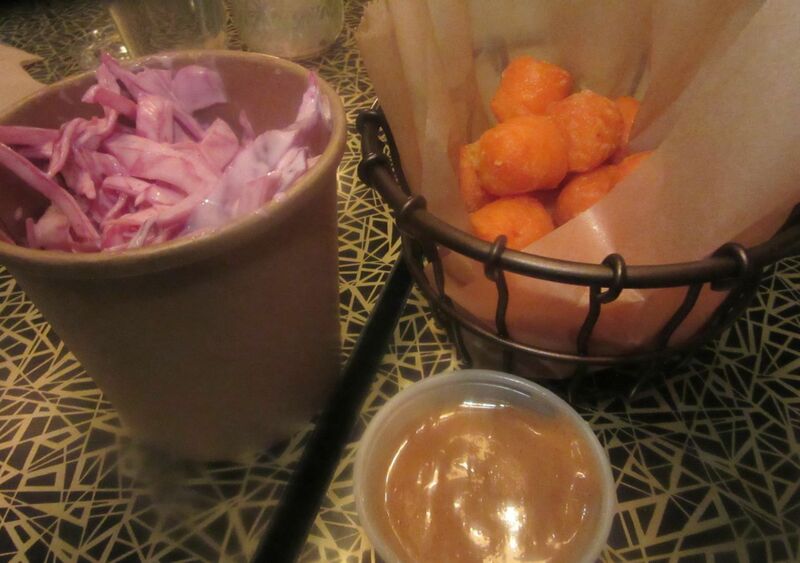 Dana and I decide to share the sweet potato tots with spicy maple aioli and the creamy red slaw while waiting. I ask for serving spoons. I could live without the tots, but the thick noodles of red cabbage in a not-too-sweet creamy dressing make an excellent aperitif. 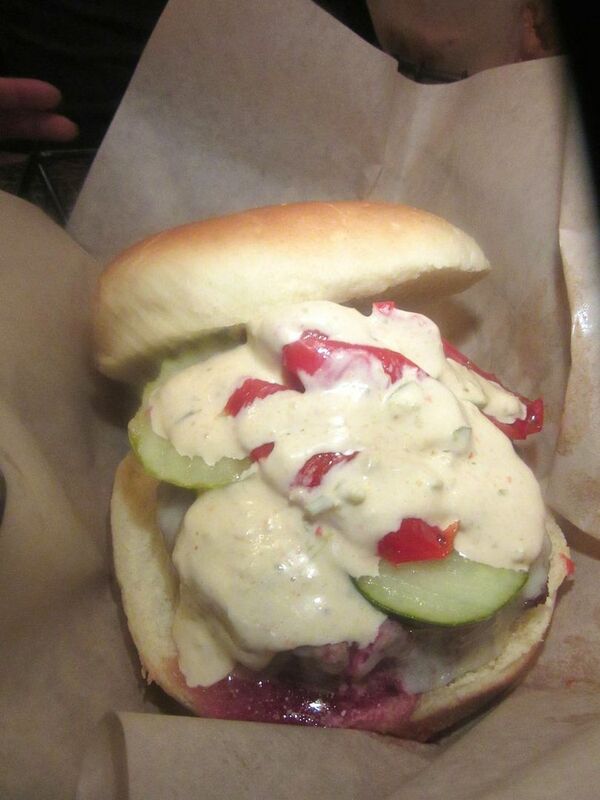 The King’s Standard with roasted tomato, pickles, white cheddar & cherry pepper aioli is a big hit. Delivery guys with thermal bags parade in and out, unzipping and zipping. A surge of young’uns settles at the window table, sharing burgers and fries delivered in metal holders lined with parchment paper. I’m getting hungrier. “Maybe Carla’s forgotten,” I say. The two of us order burgers. And then my cell does a dance. “I’m so sorry to be late,” says Carla. “Order me the King’s Classic and the Banh Mine. I’m on my way.” A couple arrives and then another. Each time the door opens, we feel a draft and look up. Nervously, I take another sweet potato tot, even though I don’t really like them. In from the rain, looking stylish and full of apologies, Carla cuts the dogs in threes so we can all taste. At last. She makes a stylish entrance in a suede hat. 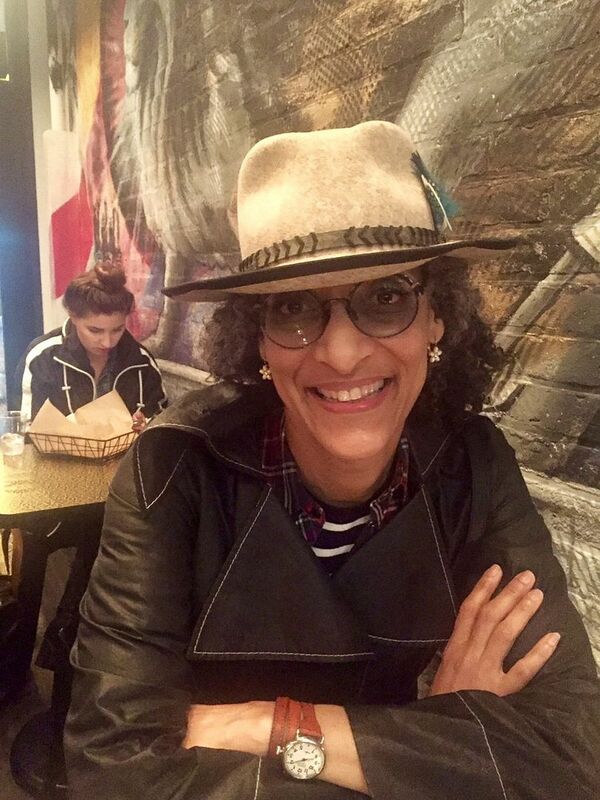 At that moment, her hotdog duo hits the table along with our burgers and a paper cornucopia piled with battered red onions plus a little tub of garlic aioli. 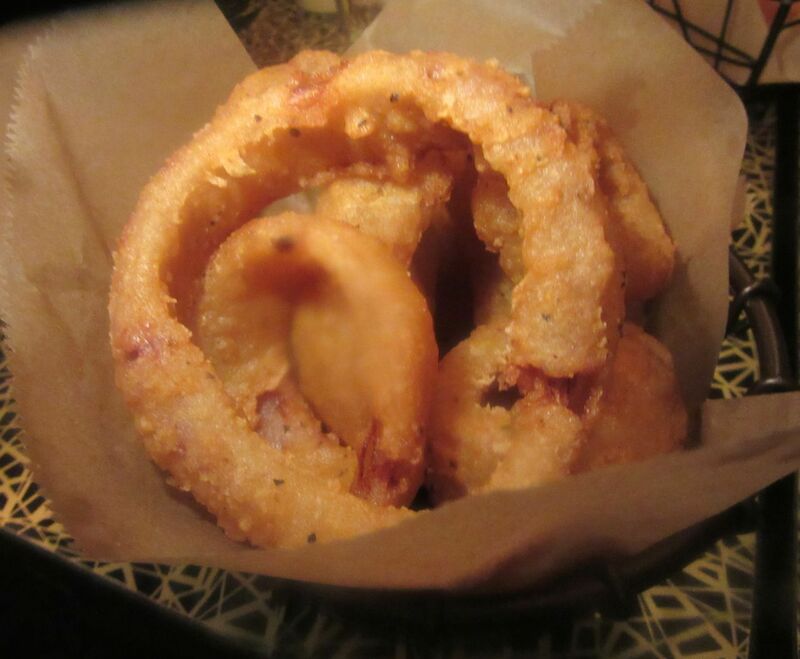 Great onion rings. 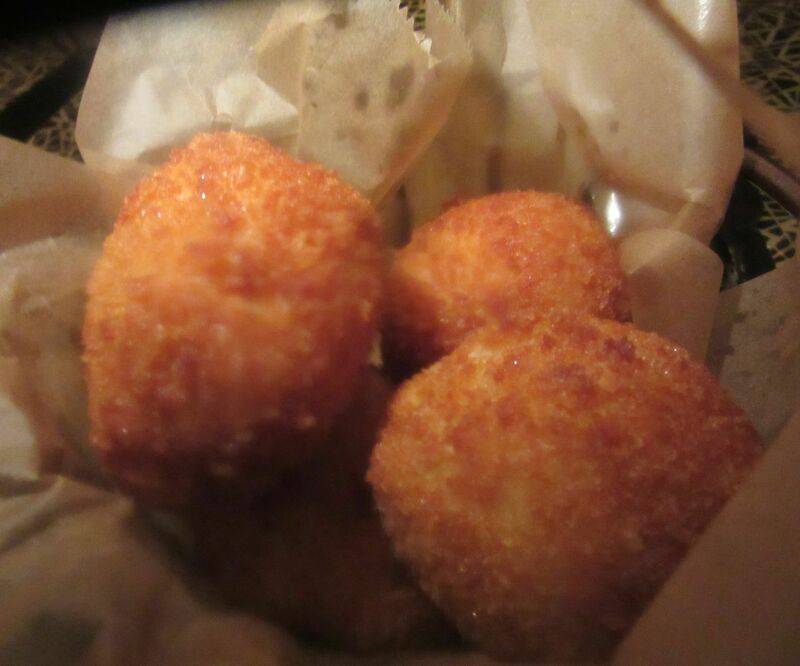 Fresh and super crisp, better than the mac and cheese balls. 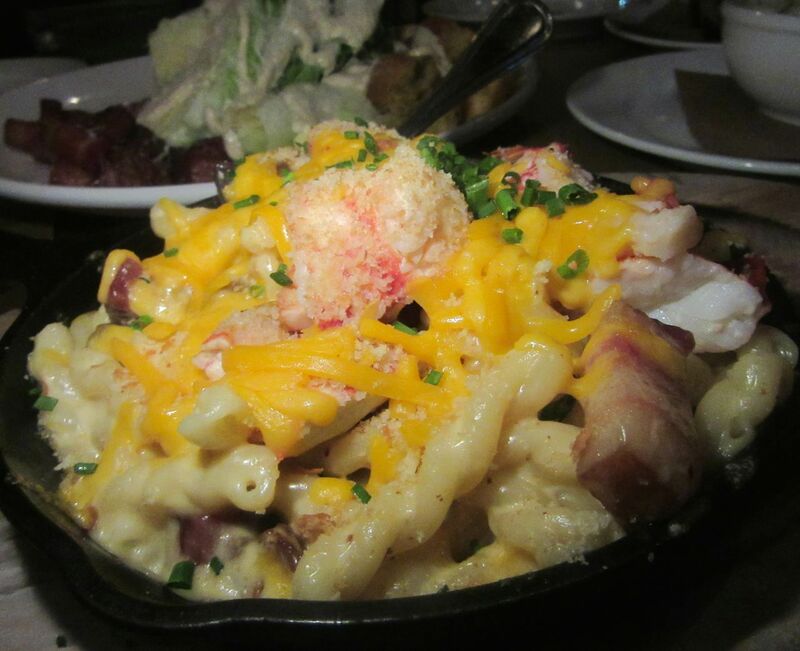 I’d had high hopes for the macaroni, but the pasta shells are lost in the cheesy melt and the fried crumb coating. I’d prefer my mac’n’cheese browned in a baking pan rather than these battered and fried macaroni balls. Carla cuts her dogs into threes. She pours half her strawberry milkshake into two plastic cups for us. I’m not a milk shake person, so the taste of actual fresh berries surprises me. We divide our burgers. 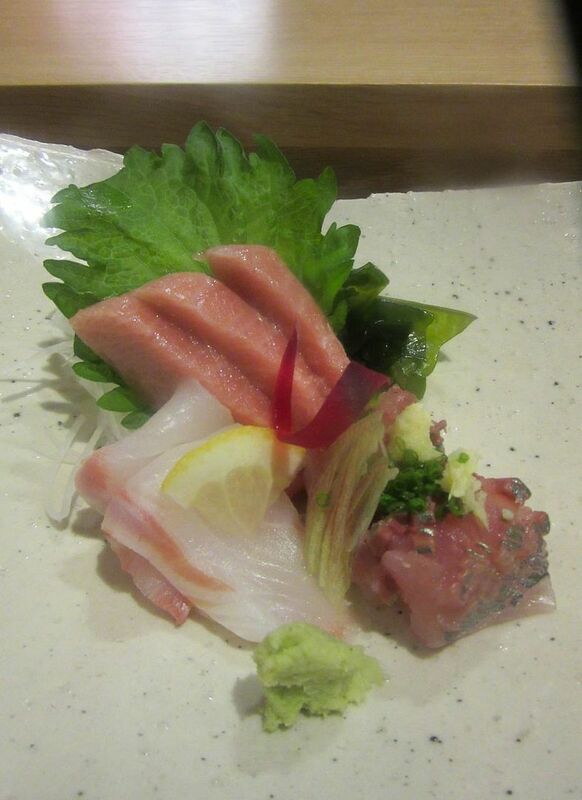 The meaty chopped wagyu, rare as requested -- in the roll with its house brand on top -- is really good. I finish a quarter of the $9.95 King’s Standard, layered with roasted tomato and pickles under an ooze of white cheddar and ribbons of feisty cherry pepper aioli. 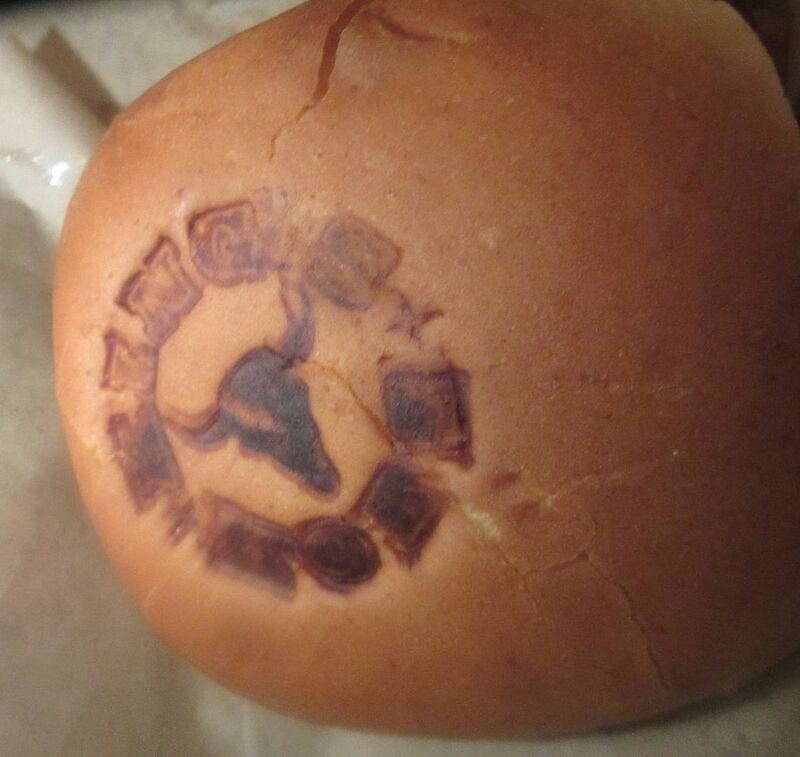 The burger buns come with the Kings of Kobe brand. Don’t miss the excellent fried red onion wings not really needing their roasted garlic aioli. These big, fat wagyu hot dogs are delicious too -- not like kosher specials and not like the thinnies of Gray’s Papaya, but voluptuous and full of flavor. Carla’s classic is smothered with sauerkraut, red onion marmalade and spicy mustard. The Banh Mine is a borrow from the Vietnamese word for bread – with ribbons of marinated cucumber and carrot, cilantro and sriracha aioli. I expected little pigs in blankets when I ordered “Notorious P.I.B., but okay. The lone waiter is endlessly accommodating, clearing stained paper away and bringing fresh. Providing serving spoons and forks and more napkins, and extra roasted garlic aioli even when no one asks, as if we are the Queens of Kobe. Our garbage mounts as we shed extra bread and barely make a dent in the Notorious P.I.B. I expect little pigs in blankets, not just another hot dog. 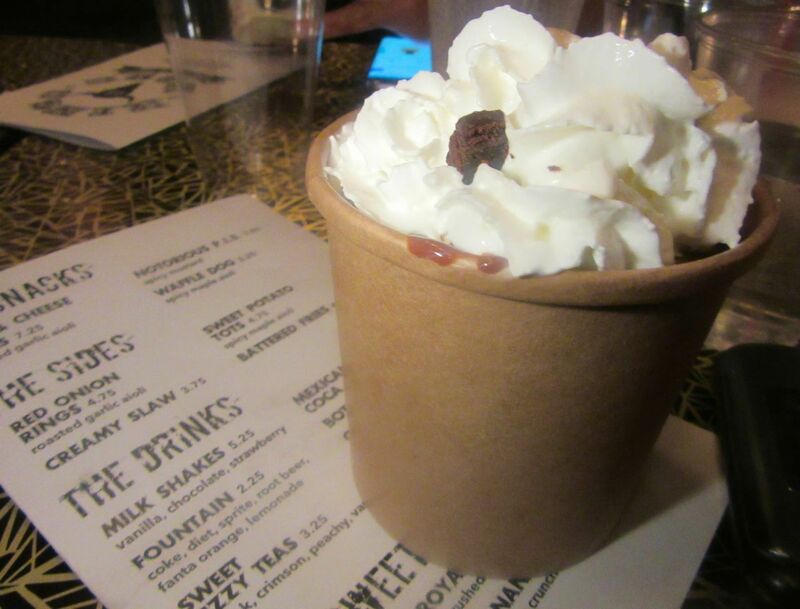 The strawberry milkshake would be a great dessert if you need one, better than this chocolate pudding. Dana isn’t tempted by desserts. 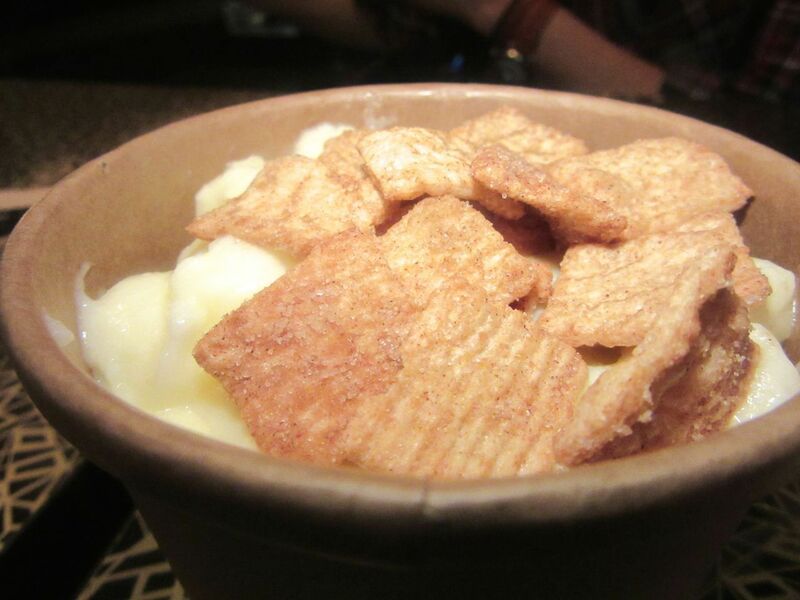 Carla has one spoonful of the banana pudding. That’s just as well as I’m not nuts about either All Hail the Banana with cinnamon crunch or the Chocolate Royal, with crushed pretzels and brownie crumble. It’s called “All Hail the Banana,” and its okay, but I’m not hailing it. 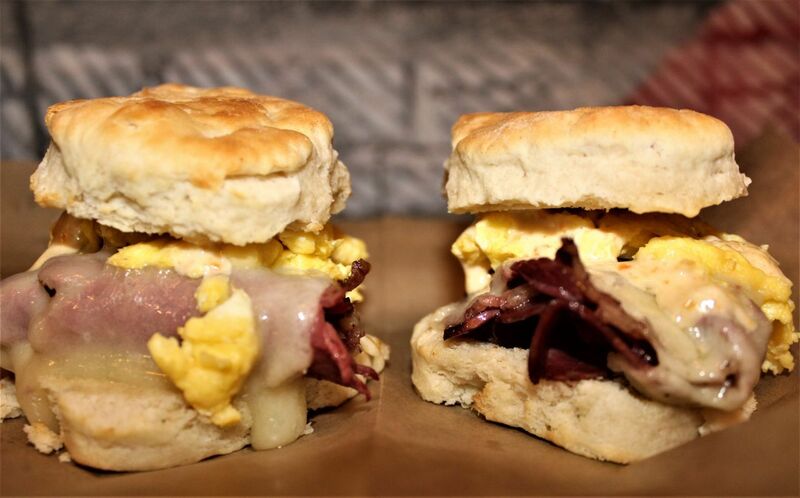 Wagyu pastrami and scrambled egg on breakfast biscuits make my no-fat yogurt routine seem quite pitiful. 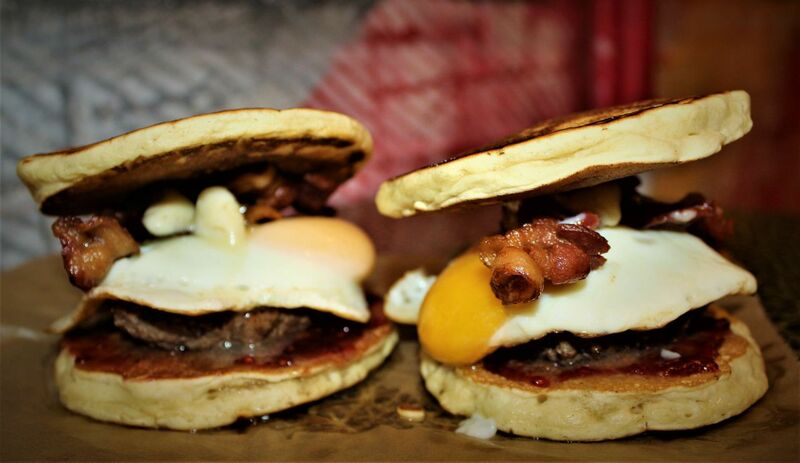 The breakfast Jester: Wagyu burger, raspberry jam, fried egg and bacon on a pancake bun. 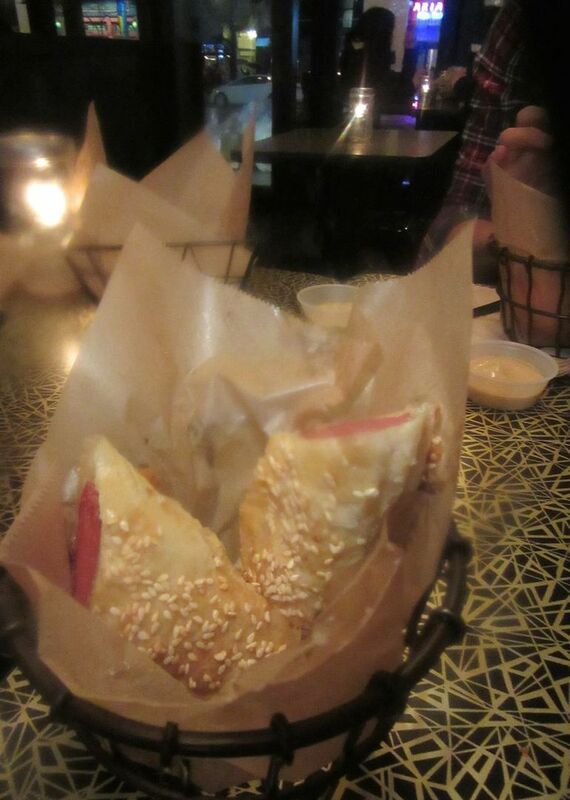 Last Saturday Cinader added weekend breakfast and brunch, with choices from $7.75 to $11.95 for the Wagyu Reuben. I’m not a brunch person. But I’m a hash browns fanatic. “Smoked paprika hash brown,” the menu offers. Perhaps I should consider delivery. Wagyu pastrami and scrambled egg on a biscuit. Or The Duke Mornington -- wagyu beef slider, sunny side up egg, cheddar, caramelized onion and chipotle aioli on brioche. It makes my customary no-fat yogurt with All-Bran seem depressingly shabby. 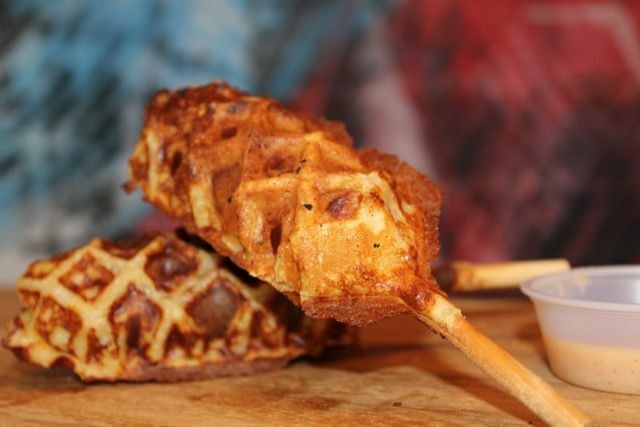 The $5.25 waffle dog comes with spicy maple aioli. 790 Ninth Avenue between 52nd and 53rd Streets. 212 247 3703. Breakfast and brunch Saturday and Sunday 9 am to 3 pm. Dinner 3 pm to 2 am. Monday through Thursday 11am to midnight. Friday 11 am to 2 am.